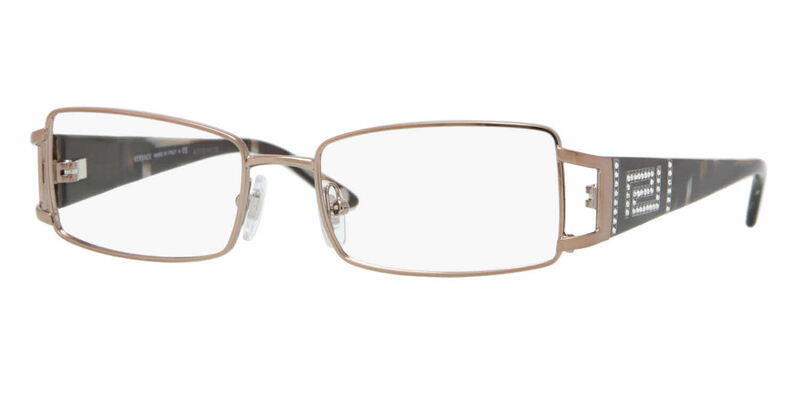 Versace VE1163B Eyeglasses are an sophisticated, stylish set of frames that are made by the fashion icon, Versace. After gaining international recognition in the mid 90s, Versace has become a famous, luxury brand that is known for its inventive patterns and styles. Versace VE1163B Eyeglasses come with a Versace cleaning cloth and protective carrying case. These frames are so classy. Frames Direct does a very good job with the lenses. I believe that these glasses are as good as what I would get from my eye doctor, but half the price. After you get one pair of glasses, you want to order another pair! I was a little nervous buying expensive progressive lens online in these beautiful frames but everything went great! The clarity is perfect and the frames gorgeous. I love the Versace eyeglasses I purchased from FramesDirect.com. They fit perfectly and I love the way they look. I was concerned about ordering prescription eyeglasses online without having to try them on first, but FramesDirect.com was helpful with the fitting and with their guarantee, I feel very satisfied with my purchase. I receive many compliments on how great they look on me. I am actually thinking about ordering a pair of prescription designer sunglasses also. 100% Satisfaction. I was referred by a friend about this website for my contacts and glasses. Not knowing, it was going to be so easy to place the order and the price was perfect. I didn't have to wait long for the shipment to come in. You would've thought I went into a local ophthalmologists. The only problem that I had was that the frame's arm was a tad short and when I called they were quick to resolved the issue. I would recommend this company. Stunning frames and the best customer service experience I have had in a long time! Shipped out quickly and I would absolutely purchase from this site again!